I am no stranger to serums and have definitely tried a few but after all these years, I have not encountered an oil-based serum before. Idonae Skin Rich Serum is an oil based serum meant to nourish the skin, provide whitening and stimulate collagen. I will dive more into the ingredients later. 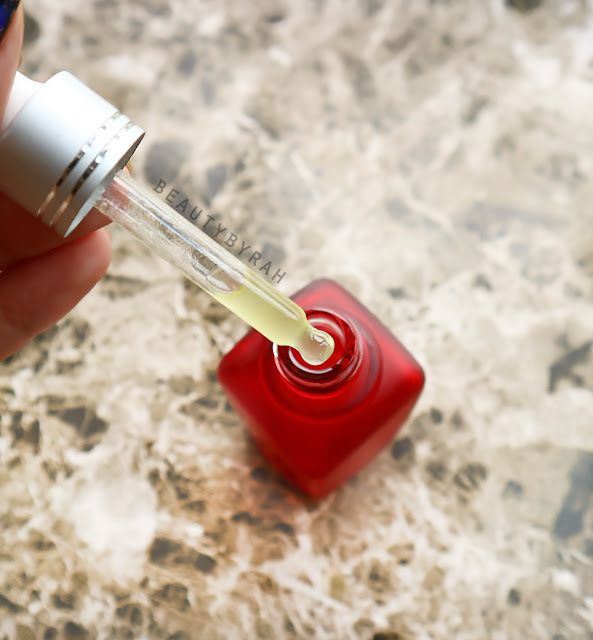 Facial oils are beneficial to the skin and can drastically improve skin conditions depending on the type of oil. I started dabbling with facial oils the beginning of this year and I discovered that some works well with my skin whereas some just clog it up and causes me to break out. Thus, I am not going to lie when I said I was pretty fearful in trying this serum out. This comes in a frosted red glass bottle with a dropper. The dropper is nice as it allows you to control the amount of product dispensed. I wished that the packaging was of a darker colour as this minimises the product the exposure to light. Whenever a product is exposed to light, the beneficial ingredients will start to break down and lose its beneficial properties. Another aspect that I am not a fan of is the branding sticker as it disintegrated after 3 uses (as can been seen in the photos). Especially since it is oil-based, the logo disintegrated faster than it should as my hands do have oil residue when I screw back the cap after application. After cleaning and toning, I like to take about 2-3 drops of this on my palm, rub my hands together and then pat the serum into my skin. Especially when it comes to oils, I do not like to apply them directly on the skin and blending them out as I find that it can get a lil too oily too quickly. I feel that 2-3 drops is sufficient for my skin and you really do not need a lot for one application. 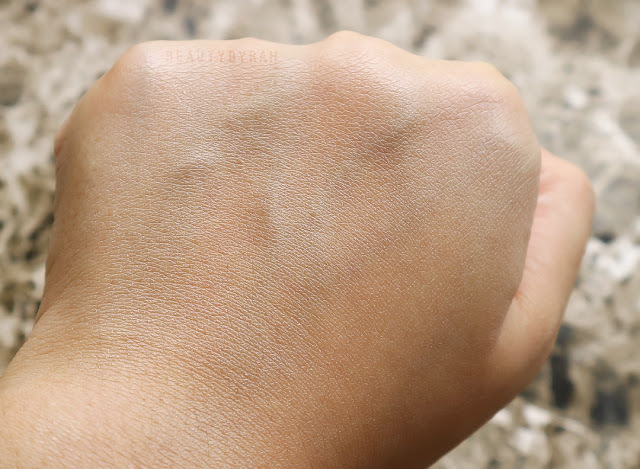 I tried 4-5 drops for a few nights and I realised that I started to have small breakouts around the cheeks and chin area - it could be that it was too rich for my skin. Especially if you're new to facial oils, I suggest 1-2 drops and slowly working your way up. One ingredient that really caught my attention was Squalane (not to be confused with squalene). This is a skin-replenishing ingredient and helps to really moisturise the skin thanks to its emollient properties. 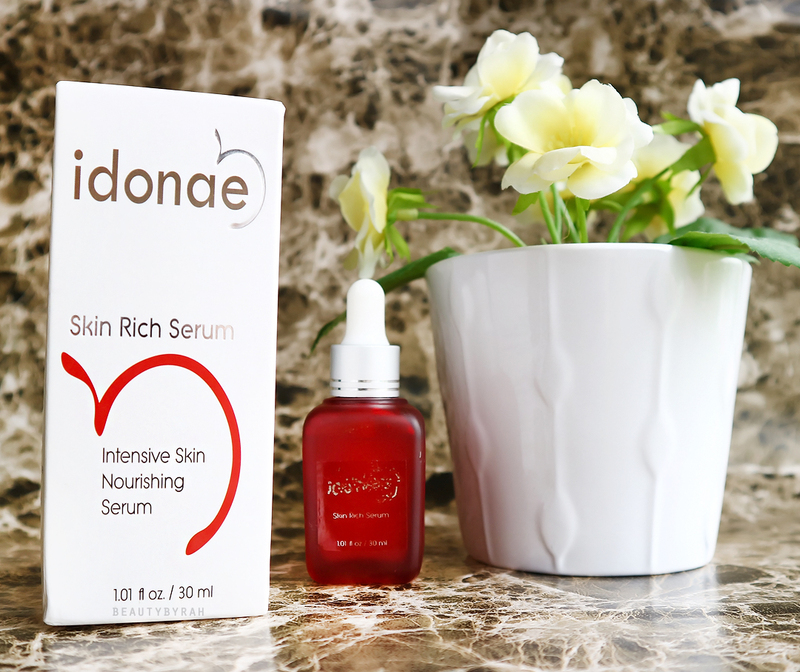 I have been looking for products containing this ingredient for a while and am glad that this skin rich serum contains it in a pretty concentrated amount as it is the second ingredient on the list (the concentration of an ingredient decreases down the list). This serum also contains quite a few oils as you can tell. The main base is Apricot Kernal Oil, which is an emollient plant oil pressed from the seeds of apricots, and has skin-smoothing, and antioxidant benefit. 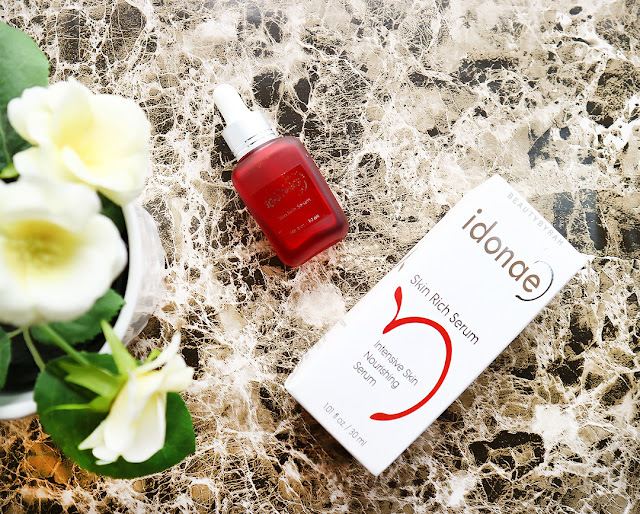 It also contains Rosehip Oil, a well know oil to combat aging, as it contains essential fatty acids, vitamins E, C and A and helps to reduces fine lines and wrinkles. I have not really encountered these ingredients before but this serum also contains Undecylenoyl Phenylalanine, (which comprises of amino acids and fatty acids and helps to lightens brown spots and even out skin tone) and Dipalmitoyl Hydroxyproline (anti-wrinkle and firming agent which helps to stimulate synthesis of collagen fibers and inhibit free radicals). The only ingredient I am not a fan of would be the essential oil mix as all fragrances (natural or synthetic) can be potentially sensitising to the skin. I am never a fan of fragrance in any skincare or beauty product it increases the risk of irritating the skin. This is the last ingredient and I do not really get a strong whiff of the fragrance when I use this product as well, which is good. 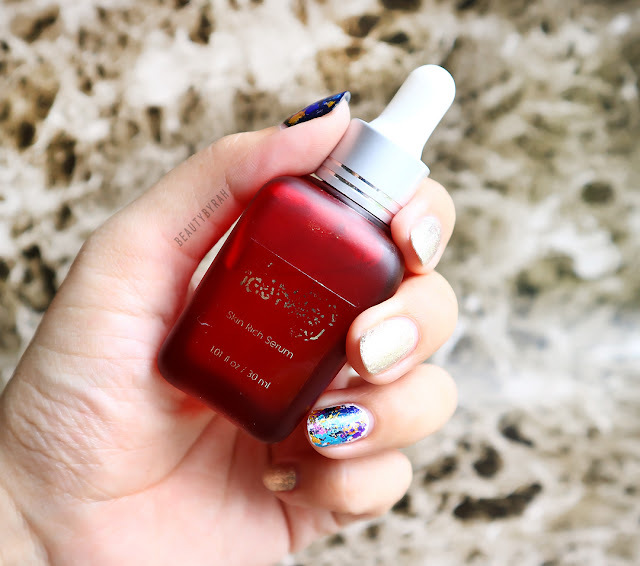 Overall, this Skin Rich Serum seems well thought out. 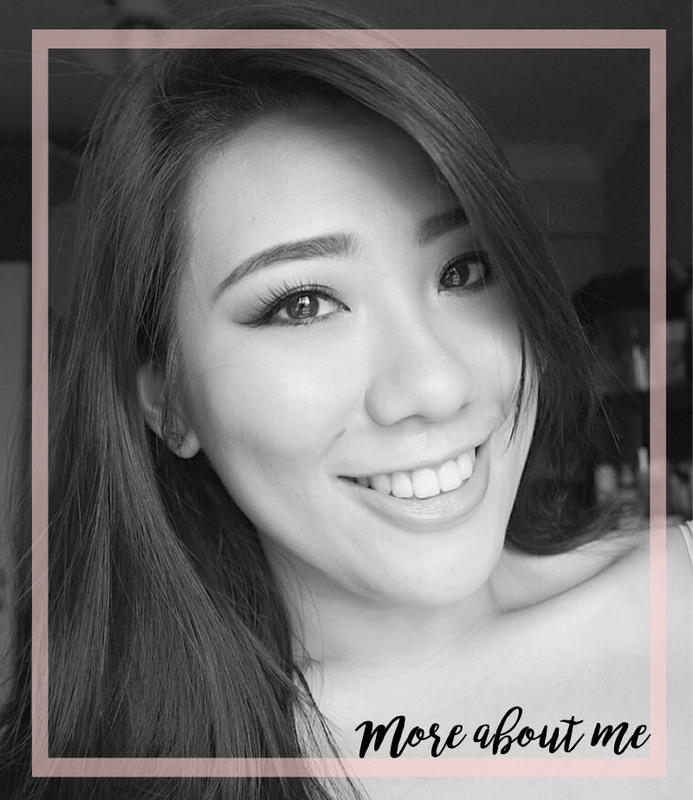 My skin does feel more hydrated and plumper after using this for 3 weeks every day and night. I will keep on using this and if I notice any more significant changes, I'd be sure to update here. This retails for SGD 99 and can be purchased off Idonae's main website here. This serum was sent for a review. Only honest thoughts are shared here, with no influence from others. I am not affiliated to the brand.